Welcome to the second installation of An Adventure in Small Games (you can read the first one here), a monthly series focused on games that cost less than $20, ideally less than $10. In this series Eve Golden Woods will focus on the indie game and what it has to offer the world of gaming. “I count the grains of sand on the beaches and measure the sea; I understand the speech of the dumb and hear the voiceless.” Those bold words, according to Herodotus, were the opening lines of the statement that would make the Oracle at Delphi the most famous and renowned of all the oracles in Ancient Greece. The Oracle was more than just a future-seer, though that has become the modern perception of their function. A religious and political entity, the Oracle served to advise rulers and politicians of the wisest course of action, though this advice was often phrased in a dangerously ambiguous way. When Croesus asked the Oracle at Delphi if he should wage war against the Persians, he was told that in the course of the war a great empire would be destroyed. Encouraged by this promise Croesus began his campaign, not realizing that the empire that would be destroyed was his own. Though the Oracle had a political function it cannot be understood through that lens alone. The Oracle was the mouthpiece of fate, an overwhelming force present in every aspect of the Ancient Greek life. The recorded stories of the Oracle, both roughly historical and deliberately fictional, share a common thread: it is impossible to resist the Oracle’s pronouncements. Whether they are resisted or accepted they will inevitably come to be. Consider the narrative of Oedipus, whose father attempts to murder him on the word of the Oracle and in doing so sets the stage for his own death. Both Oedipus and his father attempt to circumvent the Oracle’s statements and the foreknowledge that they will do this becomes part of the prophecy made about them. The zenith of this narrative trend is surely the story of Cassandra who was granted an Oracle’s abilities, but denied the power to convince anyone of what she knows. Trapped by these circumstances, she was forced to watch as the Trojan War develops and her city and family are destroyed. All of this bubbles beneath the surface of Oracle, a game released by ceMelusine as part of their game EP, East van EP. 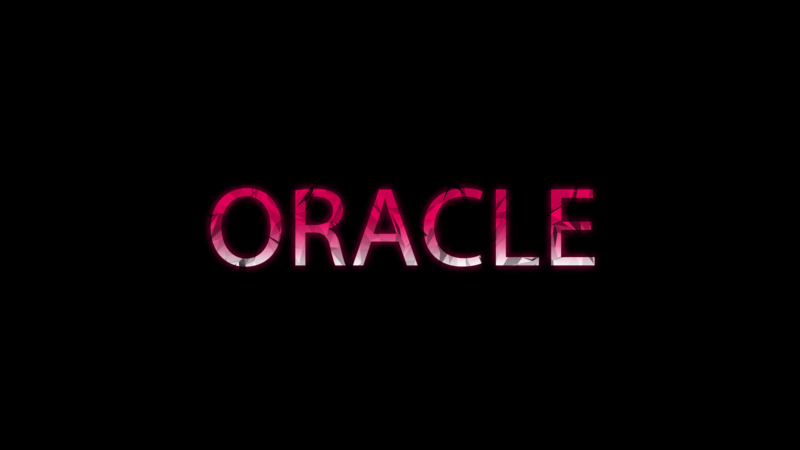 Oracle’s muted colors and simple polygonal shapes belie the dense text of the game, comprised of strange visions and fragmented words, a sense of connection between the symbols and the lives they represent. “Oracle at Analara,” the disembodied voices cry, “your sight reaches to the heavens … Tell me of my fate.” The words shift. Sometimes they call you seer or prophet. Sometimes they name you harbinger or even demon. Your power is ambiguous, neither good nor evil, but weighted only between the present moment and the span of time. Those who come to you, unseen and unknown, require your gifts. They are not here on a whim, but come compelled by more powerful forces, the desire to know who and what they are meant to be. Sometimes they speak of sacrifices, though you are not told what those are. When the words are spoken, a blackness invades the screen, like the flicker of your eyelids over your eyes when your mind yearns for sleep. You find yourself plunged into a black and white world of haunting sound and strange visions, crosses and wheels, and scarabs and pillars, images which flicker and shift against backgrounds where strange castles loom and monoliths dominate the skyline. [pullquote]The Oracle was the mouthpiece of fate, an overwhelming force present in every aspect of the Ancient Greek life. [/pullquote]What is especially beautiful about the structure and mechanics of the game is the vast space you know nothing of. Like the visuals, which presents a campfire in a dark ring of trees, with a starry sky above and many abandoned weapons scattered around, the narrative space of the game is more about what you don’t know than what you do. Lacking any signifying details to the identities of those who implore you, you must choose blindly from the symbols presented to you, choosing patterns of word and image most aesthetically pleasing. When they transmute into the pronouncements of the Oracle, you scour them in the hopes of learning more about the person before you. A thousand possible lives bubble up in your memory, and you can only hope that the combination of your words and their past will lead to a favorable outcome. It is easy to become lost in the trance of divination, the slow and meditative state that accompanies reflection on the connection between the self and the symbol, like that induced by tarot cards. This half-trance of meaning makes the actual narrative of the game a rather jarring interruption, though in its own right it proves rather interesting. Unlike other seers or prophets, an Oracle is always enshrined in the temple of a God, and they are seen to derive their power from their divine connection. The Oracle at Analara is no exception, but the nature of the God is not immediately obvious. One senses it first, from the massed weapons around the fire and the blasted landscapes of their visions. There is a sinister malevolence to the power you wield, and many of your pronouncements are ominously bleak. As the game goes on, some of the words in your choices flicker into strange symbols, and clicking on them causes an almost painful red flash to sear across the screen. What makes stories of Oracles so fascinating is the uncertain tension of their power. Croesus was undone by his own presumption, his belief that the destruction of a great empire promised him victory rather than defeat. Did the Oracle give him this ambiguous answer because the answer was part of the future that would come to be? Or were they merely hedging their bets, ensuring that no matter what the outcome they would be believed? To us, perhaps the answer seems a simple one, but the Oracle’s contemporary society would have read it differently. As Herodotus recounts in his (highly fictionalized) Histories, before he asked them to divine the outcome of the war, Croesus sent messengers to the various Oracles in Greece to test them. “What is King Croesus doing now?” the messengers asked. Croesus had deliberately chosen to do the most absurd thing he could think of. The Oracle at Delphi gave the correct answer, ensuring their place as a genuine fore teller. Herodotus also includes several stories of the Oracle’s successful predictions in the wars between the Greek states and the Persians. [pullquote]What makes stories of Oracles so fascinating is the uncertain tension of their power. [/pullquote]All of this history is to point out that an Oracle’s pronouncement may be ambiguous not because it seeks to abnegate responsibility for the outcome, but perhaps also because the ambiguity itself is part of the pattern woven between past and present. When you, as the Oracle, speak of the ending of the world and of the appearance of Lovecraftian beings, do you speak in order to invite them in? Are you a willing participant in the apocalypse or simply a mouthpiece for dangerous powers that you cannot control? It is possible, in the gameplay, to delay the apocalypse through your choices, but inevitably your curiosity and desire to see the ending will compel you to click on the symbols that lead you there. Perhaps this too is the Oracle’s answer, a knowledge that the end is unchangeable and a desire in the face of that knowledge to see it through. Like Cassandra, perhaps the Oracle willingly plays out what cannot be changed. In the days and weeks since I first played it, Oracle has remained with me. Like many works of art, its refusal to give any exposition or to guide the player towards a conclusion allows it to live in the space of emotion, in that haunting realm where the inevitable future breaks over the now and crashes down like a wave upon the self. There is no space for free will in this narrative, no possibility of changing what awaits us. It’s a view that the self-determinism of modern western culture tends to reject, but it is bound eternally to the predetermined mechanics and outcomes of video games. No matter how deftly sand-boxed a game seems or how dense and weighty its choices appear, they were set in motion long before the player picked up the controller and they exist in stasis. You cannot do what the game makers do not allow you to do. Oracle takes these restrictions and makes them explicit, makes them beautiful. It is a game about being haunted by your own future. Read the rest of the Adventure in Small Games series.